Gina M. Biegel, LMFT, is a psychotherapist, researcher, speaker, and author in the San Francisco Bay Area who specializes in mindfulness-based work with adolescents. She is founder of Stressed Teens, which has been offering mindfulness-based stress reduction for teens (MBSR-T) to adolescents, families, schools, professionals, and the community for over a decade. She created MBSR-T to help teens in a large HMO’s outpatient department of child and adolescent psychiatry who were not receiving relief or amelioration of their physical and psychological symptoms with the use of a multitude of other evidence-based practices. She is an expert and pioneer in bringing mindfulness-based approaches to youth. She is author of Be Mindful Card Deck for Teens. 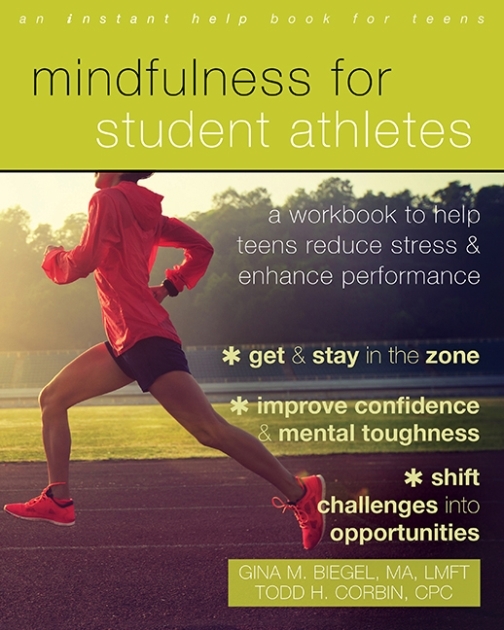 She also has a mindfulness practice audio CD, Mindfulness for Teens, to complement the MBSR-T program. She provides worldwide, intensive ten-week online trainings, and works with teens and families individually and in groups. Her work has been featured on CNN, Reuters, and in The New York Times. For more information, visit her website atwww.stressedteens.com. Mistakenly labeled learning disabled, Todd H. Corbin, CPC, grew up with extremely low self-esteem, causing years of devastating social and emotional impact. Now a mindfulness teacher, stress expert, motivational speaker, and certified coach, Todd speaks to and coaches business people and executives, salespeople, parents, teachers, students, and athletes on using mindful awareness to enhance performance and overcome stress and anxiety. Todd has been practicing and teaching mindfulness/meditation since 1994, integrating the most current research inneuroscience and optimal performance. He received formal training in mindfulness from some of the leading experts and programs in the field including: Daniel J. Siegel, Amy Saltzman, Gina Biegel, U Massachusetts Medical Center’s Mindfulness-Based Stress Reduction (MBSR), mPEAK: Mindful Performance Enhancement, Awareness, and Knowledge from UC San Diego Center for Mindfulness. Todd also received extensive training in meditation directly from best-selling authors Deepak Chopra and Neale Donald Walsch. As a result, he created a mindfulness based curriculum for children and teens in 2003 based on their teachings and Todd’s own insights taught at the Chopra Center for Well-Being in Carlsbad, CA.